One great thing about being shut in from snowy weather is having your TwinSpires account, access to our blogs and live harness racing streams. If you were lucky enough to be in an area unhampered with power outages or you could connect with a mobile device if the cable was down, you had TwinSpires action at your fingertips. Our two overnight features’ choices at the Meadows on Feb. 14 were competitive, hitting the board, but not winners. Hickory Big Red was second ($7.60, $6.40) and TT Tucker was third ($4.40). The horses-to-watch list (H2W) was, once again, the source for profits. See below for the rundown of winners, including the biggest of the early season. Make note that many of our contenders did not race due to the closure of Freehold, Yonkers and Monticello due to inclement weather. They will be listed again in Thursday’s blog if they are entered or thereafter if they are not. Every Wednesday night, weather permitting of course, TwinSpires’ 10-percent-bonus Buffalo Raceway 50-cent Pick 4 wagers continue. We assist with suggestions for your ticket via Twitter -- @FrankCotolo, @TwinSpires and @BuffaloRaceway. The H2W results list across-the-board prices. Also, exactas are included when a H2W horse finishing first or second completes the result with a race favorite or another H2W horse listed in the same race (an asterisk appears when both horses were listed to complete the exacta). Failed choices from our overnight features appear for the second time in the H2W list, as with Double Dribble, from a Meadows overnight offered last week, listed as a winner below. The Meadowlands has cancelled what would be the first stakes series of the season, The Presidential. As it turned out, only a dozen horses were entered and while that would normally be enough to have a leg or two and a final of the traditional affair for older pacing males, the majority of the entries came from a single barn. 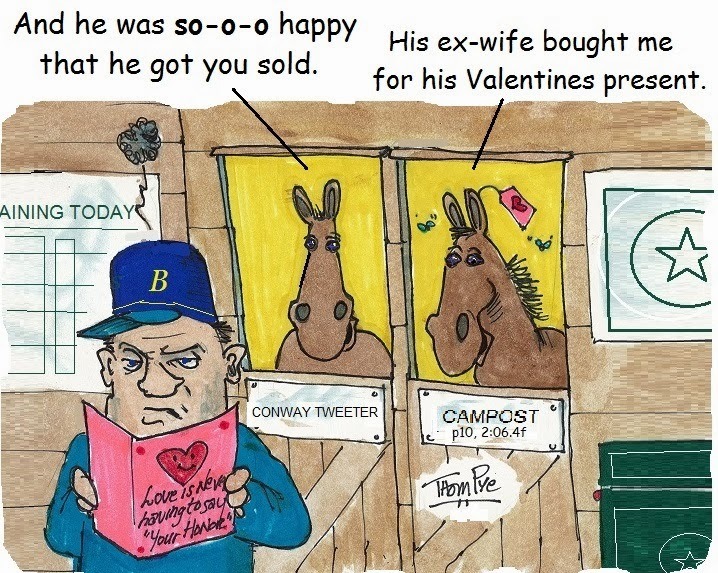 Ron Burke’s stable entered too many of the twelve potential foes, making for a bad situation in the coupling department, which would not be appealing to bettors anywhere. Horse racing faces dire challenges to continue in British Columbia, according to recent reports and province-industry giant Chuck Keeling. Fraser Downs, formerly Cloverdale Raceway in Vancouver, is owned and operated by Keeling’s Great Canadian Gaming. Keeling says the end of racing days may be near. Fraser has had its race dates cut dramatically over the past few years. The oval has only 26 race dates scheduled in 2014. “There’s so little money to be made because of the [number of] race days, that it’s like they’re turning us against each other,” said horseman Sandra Roberts in a story in the Cloverdale Reporter. “It’s impossible to make a living if we’ve only got four or three months of racing.” Keeling, whose family at one time owned Cloverdale-turned-Fraser, said, “this be a sunset industry … but there’s precedent – like poker – for it not to be.” To read the full story, please click here. Winning-favorites percentages at harness tracks where you can currently wager from your TwinSpires account are higher than the general average of public-winning favorites at any pari-mutuels track. In the U.S., Dover leads with 45 percent. Following in descending order are Monticello (42), The Meadows (39.7), Cal Expo (39.5), Northfield (38.9), Freehold (38.8), Yonkers (38.5), Buffalo (38.1), Pompano (38), The Meadowlands (37.5) and Miami Valley (37). In Canada, Northlands leads with 44.9 percent, followed by Flamboro (37.8), Woodbine (31.2) and Western Fair (31). Those numbers should not discourage anyone from playing harness racing, nor should they encourage a player to start keying every favorite that moves. The statistics for second, third and fourth choices are not made available but they obviously are split between the 60-some-odd percent left from all of the above numbers. As is our policy when finding contenders, look to wager upon the second and third choices that fall into the 60-percent group, doing so as late as possible in the betting.